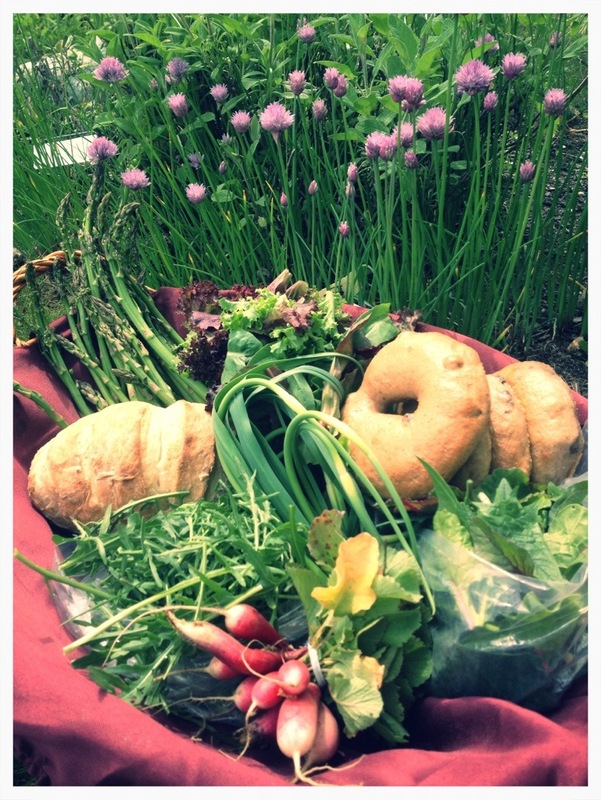 Around the Bend Blog | the farm @ Echo Bend | Honoring the echoes of the past while growing sustainably for the future. Hey! It’s August! The baskets reflect the bounty of high summer with several new offerings. Yippee!!! So much potential for fun recipes. I’ll share an absolute favorite of my family’s, as all of the ingredients are present. I love this recipe. I always double and triple it so that I can have the leftovers for breakfast the next morning. Before I share, though, I would like to thank the Aldrich family for taking such good care of the farm while I was away, and to shareholder Tom Innes and fiance for donating some of their time to weeding the garden. (It’s in a pretty sad, sad state this year.) I appreciate all of your time and support. Truly. p.s. I often up the soy sauce to taste. 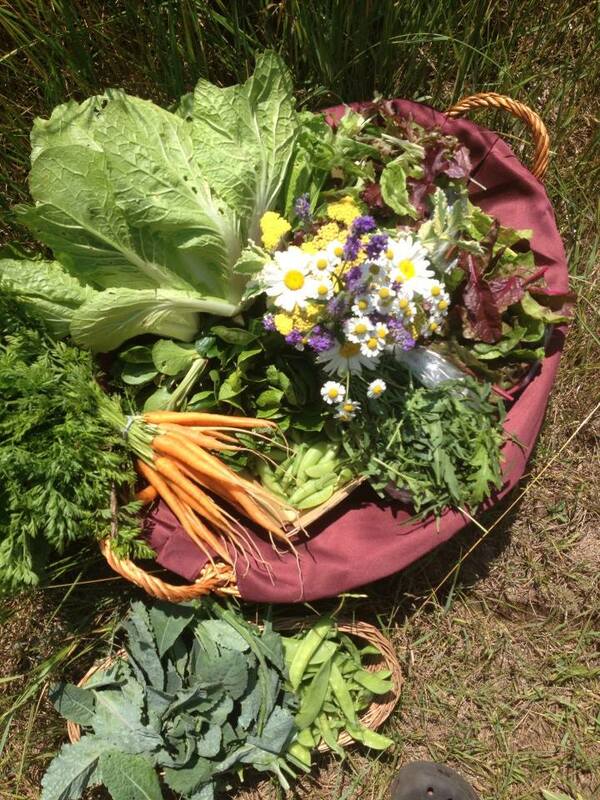 A beautiful June harvest day produced a lovely basket of freshness for you this week. I’m grateful the rain held off, as muddy harvest days are no fun, but keep your fingers crossed for rain soon, as the garden is entering a state of growth and could really use some liquid refreshment! With the addition of snow peas, you could make an easy stir fry with the cabbage, braising greens, and scapes. Mmm.. Summer stir fry. Nothing better. Broccoli Raab: — make a foil boat and drizzle with olive or sesame oil, chopped scapes, and some sea salt and throw on the grill for an easy smokey side of greens! Enjoy the greens of June. Tomatoes are all flowering and setting fruit for future harvests, and the basil and cilantro is beginning to get growing. Oh, and if you would like to order baked goods for pick up with your shares each week, just let me know! 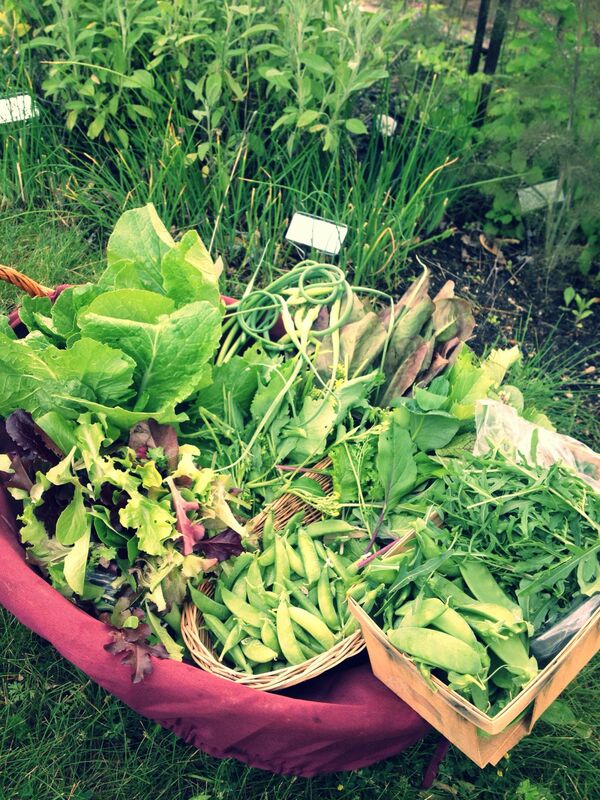 We have some new veggie additions this week, as things are FINALLY starting to take off! I know some of my customers will be thrilled to see the sugar ann snap peas in their basket this week. 🙂 They really are the perfect go-to beach/hiking snack, for all ages. Raab is similar to broccoli, just a tad bit more bitter. It’s a favorite in Italian dishes, and it’s great sauteed with eggs or thrown into an easy pasta with olive oil, parmesan, sea salt, and a squeeze of lemon. Asian braising greens are a mix of tatsoi, kale, bok choy, and mizuna. They can be eaten fresh, for a spicy flair, or cooked with like you would any green. The new brewery opening this week in Frankfort, Stormcloud, will have an “Echo Bend” pizza, which will feature a changing selection of our available goods. 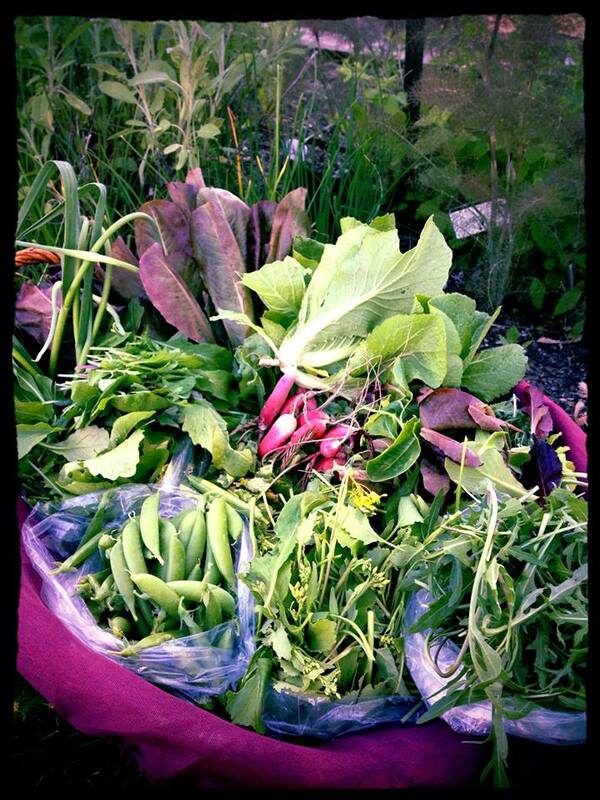 Last night they topped the Bender with snap peas, scapes, basil, and roasted radish. 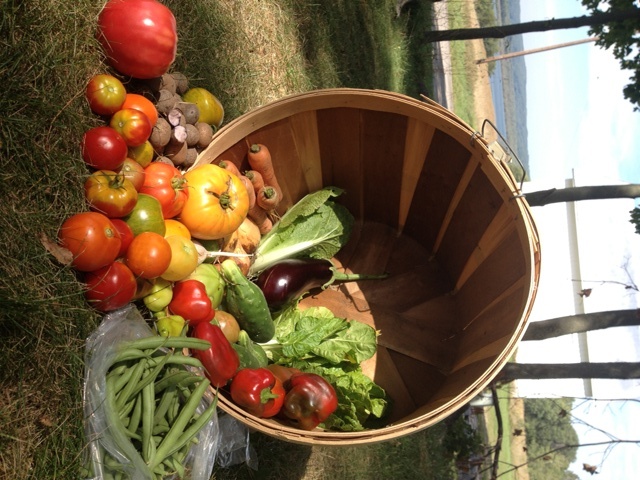 Weekly subscription baskets of Echo Bend GREATNESS begin this week! It has been a SLOOOOOOWLY growing spring, but today we harvested enough to nicely trick out the first shareholder baskets of the season. Yippee! The mix of baby chard, spinach, and lambs quarters can be eaten fresh or sautéed. Scramble some fresh eggs on there! Garlic Scapes– these flower stems of the garlic plant are a wonderful fresh garnish for salads of all types, or sauté and use them much as you would garlic cloves. I love them, with the sautéed greens, as a flatbread/toast topper, drizzled with quality olive oil and some grated Parmesan or goat cheese. Radishes–go all mid-century and have a cocktail hour — nice old fashioned or highball with radishes dipped in salt. Enjoy the extra treats of baked goods thus first week, on us, as a thank you for supporting the farm. When we began the farm, one of our goals was to form a strong connection with our community. To make a difference in your diets, your meals, your lives. I didn’t want to just sell you some carrots and peas. 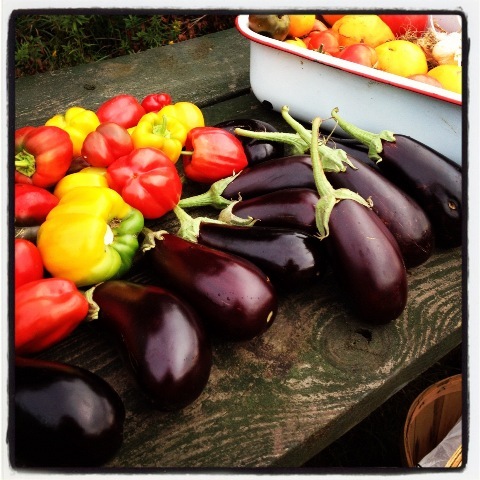 I wanted to share a love of healthy, ethically-grown food. Swap recipes. 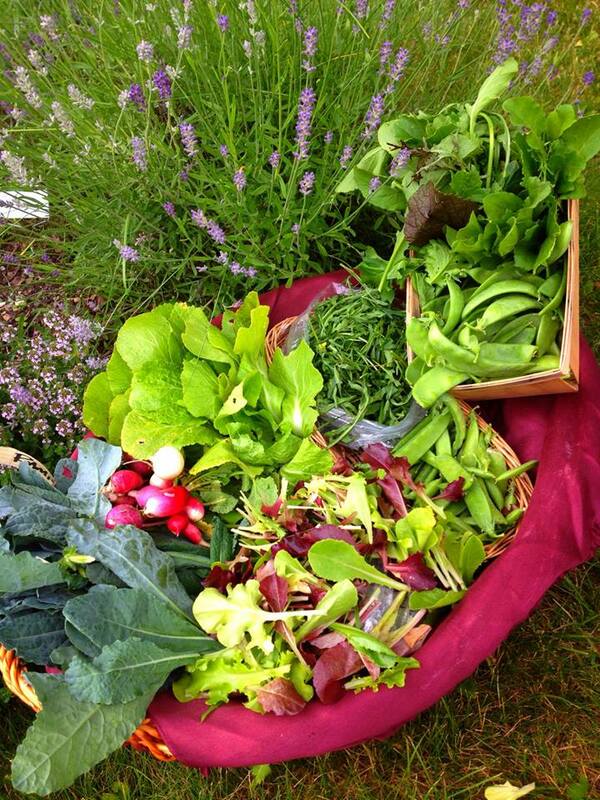 Heck, create recipes on the spot based on what the garden offered up that day. I wanted to hear from you how you would be enjoying the products I had planned, planted, nurtured, tended, harvested — not JUST your mouth-watering concoctions, but how you connect with friends and family over your meals or canning parties. How your multiple batches of salsa had been adding zip to your marriage. I wanted you to send me recipes to make for you out of the bake ovens to add to the product line. I wanted to share my love and knowledge of growing with you. This year we have begun to receive holiday cards from our customers. Mid-September brings the last of the chickens and turkeys for the season out on pasture to fatten up on greens, and the pigs will be butchered here at the farm tomorrow morning. There is a noticeable slow down in growth in the garden with the changing light. The vines are not feeding the fruits anymore, they merely seem to be holding them up, dangling them forth into the season’s remaining sunlight and warmth in the hopes that they will ripen before those overnight frosts come calling. As you can see, baskets are starting to get a bit smaller as the season winds down. We’ll definitely have a decent harvest next week, but we’ll just have to play it by ear after that, dependent on Mother Nature’s whims. –I was skeptical when I first tried this recipe from The Splendid Table (one of my favorite NPR shows), but the sum of the parts…AH. MAZ. ING!!! Straight from 19th-century American cookbooks, these big chunks of ripe beefsteak and green tomatoes get bathed in a warm, garlicky, sweet-sour dressing. They stand on their own, top greens, or make a good potato-tomato salad. Do you have a favorite recipe? I always welcome you to share your favorite recipes using ingredients from your share baskets. 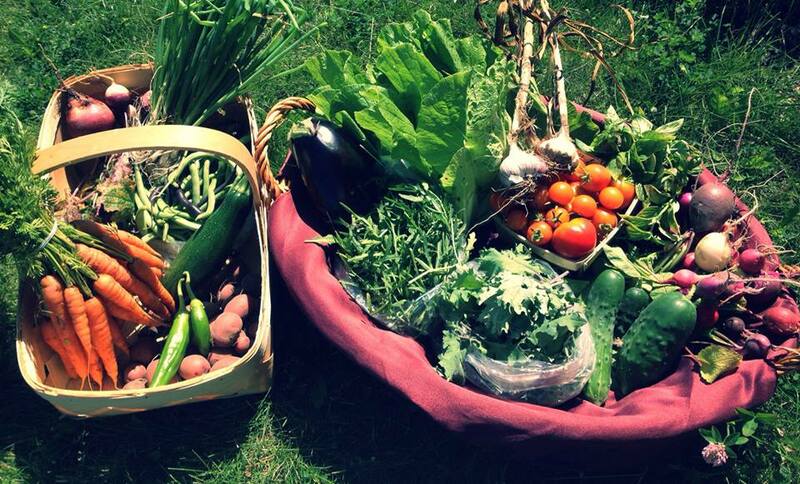 That’s part of what belonging to a community farm is about! Remember to bring your share bag/basket/box back at pick-up time next Wednesday!! For now we can thumb our noses at the idea of fall and frosts, but it approaches more rapidly than we might imagine on the warm beachy days filling this week. For now, though, we luxuriate in tomatoes and sweet peppers, red and yellow. The cooler nighttime temperatures make the heirloom tomatoes a bit more fragile, though, so be sure to take them out of the bags and set them out on the counter in a single layer. And eat ’em up tout suite! If anyone would like extra basil for making pesto or the like, please let me know! A full bag is available at a discounted rate. These summer-loving veggies will be joined this week with some early fall cool-season lovers, like radish and cabbage. Hopefully we’ll get to enjoy some more broccoli raab, also, before the end of the season. In small saucepan combine vinegar, sugar, and pinch of salt and pepper. Bring to boil over medium-high heat, then reduce heat to low. Cook, stirring occasionally, until sugar dissolves, 2-3 minutes. Remove from heat and cool completely.While vinegar mixture is cooling, cut cucumbers into slices 1/4″ thick and place in large bowl with onion and chile. Pour the vinegar mixture over the veggies and toss to coat. Let stand at room temp. for at least 30 minutes, stirring occasionally to blend the flavors.Just before serving, coarsely chop the cilantro and peanuts. Stir cilantro into salad. Top with peanuts and serve at room temperature. ROASTED TOMATO SOUP — http://www.101cookbooks.com/archives/roasted-tomato-soup-recipe.html — Rich and deep, simply accomplished; with just a handful of ingredients — all from your share baskets.